Ross King is the author of the bestselling Brunelleschi’s Dome: How a Renaissance Genius Reinvented Architecture and Michelangelo & the Pope’s Ceiling, as well as the novels Ex-Libris and Domino. 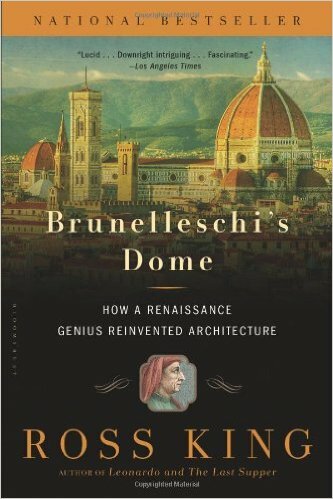 Brunelleschi’s Dome is the story of how a Renaissance genius bent men, materials, and the very forces of nature to build an architectural wonder we continue to marvel at today. Denounced at first as a madman, Brunelleschi was celebrated at the end as a genius. He engineered the perfect placement of brick and stone, built ingenious hoists and cranes (among some of the most renowned machines of the Renaissance) to carry an estimated 70 million pounds hundreds of feet into the air, and designed the workers’ platforms and routines so carefully that only one man died during the decades of construction—all the while defying those who said the dome would surely collapse and his own personal obstacles that at times threatened to overwhelm him. This drama was played out amid plagues, wars, political feuds, and the intellectual ferments of Renaissance Florence— events Ross King weaves into the story to great effect, from Brunelleschi’s bitter, ongoing rivalry with the sculptor Lorenzo Ghiberti to the near catpure of Florence by the Duke of Milan. King also offers a wealth of fascinating detail that opens windows onto fifteenth-century life: the celebrated traditions of the brickmaker’s art, the daily routine of the artisans laboring hundreds of feet above the ground as the dome grew ever higher, the problems of transportation, the power of the guilds.